When the Indy first arrived on the scene, it was tantalizingly close to attainable. Marketed as a "cheap" Unix workstation, it was SGI's push to get people to use their machines for all types of graphics work, 2D or 3D. For it's time, the machine is pretty revolutionary. 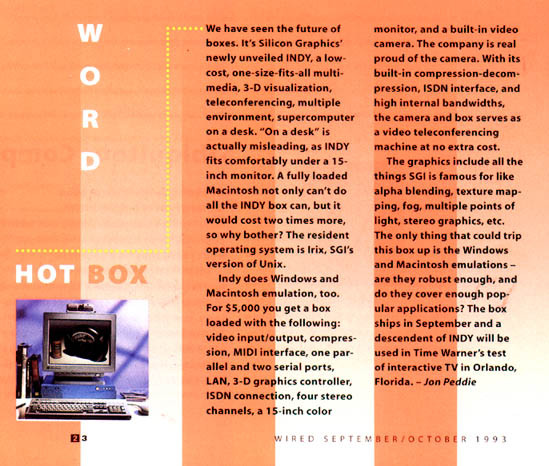 It was a low cost Unix workstation that excelled at 2D graphics (it's 3D capabilities were pretty minimal), was reasonable fast (even slow SGI systems seem fast because their graphics cards update the screen so quickly), and featured an ISDN port, a built-in camera, videoconfernceing capabilities, and all kinds of cool stuff. Starting with the R4000, the processors moved up the range to also include the R4600, the R4400 and the R5000 (yes, the 4400 came after the 4600, I don't know why). Graphics possibilities ranged from low end 8bit color to 24bit to 24bit with some 3D capability. I will attempt to describe the machine I have here, and hopefully, along the way, explain as much as I can about the hardware in general. Here's the Inside of an Indy. This one has a 133Mhz R4600 (check out the size of the heat sink!). From left to right you can see the power supply, the ram and CPU, the graphics card and the HD's. The Indy uses standard 72pin True Parity SIMMs. If I recall correctly, it can accept SIMMS up to 32MB, allowing the machine to be expanded to 256MB of RAM. The SIMMs are arranged in 2 banks of 4SIMMs. Each bank must be filled with the same density SIMM. This one has 8MB SIMMS for a total of 64MB. The CPU sits above the motherboard in it's own little "module". Thus, upgrading the CPU is as easy as plugging in a different module (though in many cases, you also have to change a PROM under the graphics card). Sitting the CPU in it's own "bay" also allows air to get under the CPU module, which I assume aids in cooling. Processors ranged from (lowest power) r4000pc -> r4000sc -> r4600pc -> r4600sc -> r4400 -> r5000 (highest power). PC means Primary Cache, and SC means Secondary Cache. A PC cpu only has Primary cache and the SC cpu has both a Primary cache and a Secondary cache. Thus an R4600SC/133 is actually quite a bit snappier than the R4600PC/133. 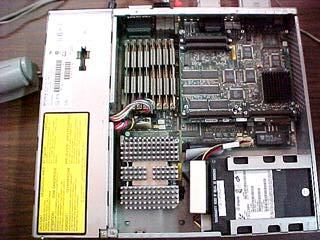 The Graphics Card sits above the motherboard, and you'll note that there are more connectors on the graphics board to carry a graphics daughterboard. The video options did include a video (NTSC) card, or an XZ graphics option, which gave you up to 4 geometry engines, but still had no texture memory. The Indy has 2 drive bays, one ontop of the other Each bay can hold a single 3.5 inch device, using narrow (50 pin ribbon cable) SCSI. Each device can only be "low profile" or not more than 1 inch high. The Upper bay was really designed for the SCSI 'Floptical' drive, a floppy that took both standard 1.2MB floppies and 21MB flopticals, media that is magnetic on one side, and optical on the other. Starting from the top left is the 3D specs connector. This was for a system that allowed the user to connect a special pair of LCD shutter glasses, and this would link with the display to provide a 3d effect. Next to that is the Monitor Video connection, which is of a 13w3 type. Below the video connector (hidden in the photo), are four mini-jacks, headphone, microphone, line-in audio, line-out audio. 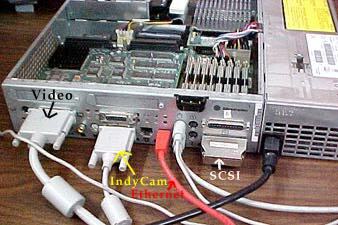 Between the Video and Indycam connections are a Composite Video in and an SVIDEO in. This, combined with with audio inputs allowed the Indy to capture video, and even create Quicktime, as well as MPEG. Next is the IndyCam connection. Directly above it is an AUI ethernet. Between the IndyCam and the 10Base-T Ethernet is the ISDN connection. The ISDN adapter was an S/T interface, requiring an external network terminator, or NT-1. It was cheaper to build that way at the time, but NT-1's are damn near impossible to find these days, since everything now comes with a U interface and has the terminator built in. Then comes the 10Base-T Ethernet with the bright red cable in the photo. Then is the mouse and keyboard connectors. 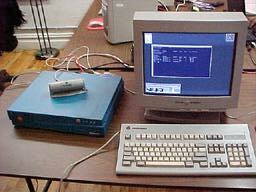 Note that the Indy was the first SGI machine (unless the Indigo 2 came first) to use standard "PC-style" mouse and keyboard. Thus, if your mouse or keyboard broke, you could run out to a local store and get a replacement, with the only problem being that with the mouse, you really must have the three button type. Next is Serial Port 1 and Serial Port 2. In my photo, nothing is plugged into those. The last 2 are the Parallel port and the SCSI port. 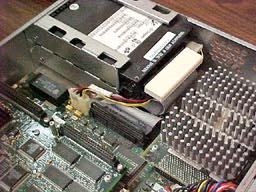 For external SCSI, the Indy uses the mini-50 type connector. In my photo, there's a terminator on the external SCSI. 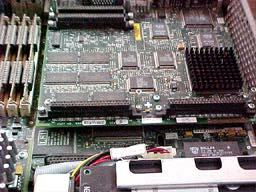 Many SGI's push their SCSI bus as far as they will go, so termination is actually very critical on these machines. The Indy caused such a sensation when it was first hyped by Silicon Graphics, that a 1993 Issue of Wired Magazine declared that this was the machine to get it you wanted to be on the cutting edge.